We ranked all 36 Oregon counties by the 2011-2015 age-adjusted rate of new cancers per 100,000 residents, the most recent data available, as compiled by the U.S. Centers for Disease Control & Prevention. 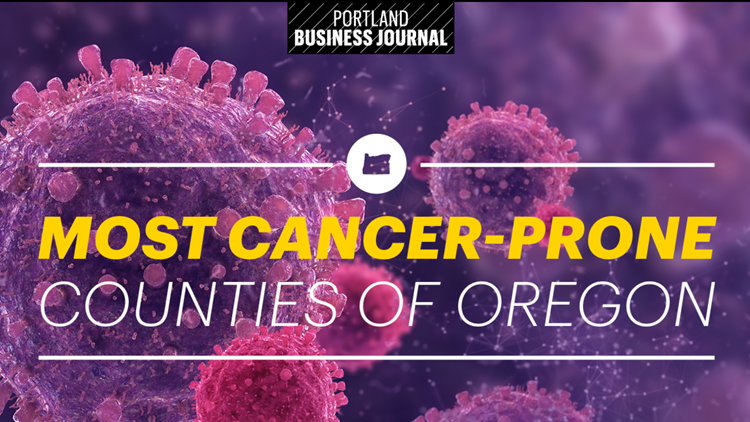 PORTLAND, Ore. — Oregon's 10 most cancer-prone counties are not all-urban or all-rural, nor are they concentrated in one geographic portion of the state. Some are close to the state's biggest metro area, while others lie in Central and Southern Oregon, the Coast and along the Columbia River. In 2015, Oregon had a new cancer rate of 399.6 per 100,000, based on 19,883 cases, ranking it 42nd among U.S. states and the District of Columbia. Western states generally fared better than Eastern ones. Nevada had the lowest rate at 348.8 followed by New Mexico, Arizona, D.C. and Colorado. Kentucky had the highest new cancer rate at 512 per 100,000 people, with Delaware, Pennsylvania, New York and New Jersey rounding out the top five. Oregon's death rate from all cancers in 2015 was 160.4 per 100,000 people, when 8,093 cancer deaths were reported. It ranked 27th for that factor, indicating that the cancers afflicting Oregonians were more often fatal or received less effective treatment than residents of other states. On a brighter note, the statewide age-adjusted rate of new cancers declined 16.5 percent between 2005 and 2015, while the rate of cancer deaths fell 14.1 percent.